Indexed in: BIOSIS Previews, EBSCO. Many factors are known to lead to IR which, in view of the great variety of diseases exhibiting IR, suggests that they converge toward a common point from which tissue IR is initiated. The fact that by far not all IR states worsen toward diabetes indicates that this element may be only transiently disturbed by acute pathologies and repaired. Conceivably, those patients unable to recover over a given period of time experience a delayed development of the deleterious consequences of IR such as cardiovascular diseases or metabolic syndrome or diabetes. Since 1) the main physiological role of insulin is to supply the skeletal muscle cells with the excessive glucose in postprandial periods and 2) capillary flow is ultimately the key determinant of nutrient delivery to cells, we would like to expose and discuss a new concept stating that microcirculation and insulin sensitivity are linked such as to function both ways. In this book, we describe many puzzling observations according to which IR and microvascular dysfunction are usually found concomitantly, well before cardiometabolic diseases are clinically observable; this parallel can even be seen in normal, healthy populations within a normal range of insulin sensitivity. This means that microvascular dysfunction could be a cause of IR and thus represent the guilty element underlying IR in so many clinical disorders. Bouskela et al. present a concise but complete overview of the multiple specificities of micro-vs macrocirculation. It is shown how closely structure and regulation of microvessels correlate with the functions of individual typical segments of the microvascular tree (arterioles, capillaries, venules). In a complementary chapter, Kraemer-Aguiar and Bouskela detail and critically review the various techniques used to measure endothelial function and microvascular reactivity in humans. Indeed, most information is only partly or not at all derived from the microvasculature. These informations are of utmost importance for sorting the plethoric amount of published data in this field, as also thoroughly discussed in the first part of the last book chapter. Frisbee and Brock review data on microcirculation and IR by comparing IR in the presence vs absence of obesity in rodents. They give detailed information on the impact of IR on dilator and constrictor responses as well as capillary perfusion, and highlight the integrated way microcirculation functions. 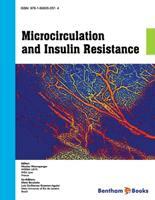 The clinical aspect of IR and microvascular dysfunction is the subject of the chapter by Serné et al, focusing on obesity and hypertension, two major components of the metabolic syndrome. In a very in-depth analysis of a broad series of consequent investigations, they delineate how microvascular and metabolic factors are linked and they particularly shed light on the links between adipose tissue and the microvasculature. Some selected mechanistic aspects are more specifically developed in a series of chapters because of their recognized importance for microcirculation in pathological circumstances. Adipose tissue being a major source of inflammatory factors, Singer and Granger deal with the impact cytokines may have on the microvasculature and how the subsequent defects underlie cardiovascular pathologies affecting obese patients. Low-grade inflammation is doubtless one main common denominator between the vast majority of diseases characterized by IR. The endothelium, playing such prominent roles in vasomotricity and nutrient transfer, is damaged by inflammation as well as by oxidative stress. Rösen and Rösen provide an overview on the origins, mechanisms and consequences of oxidative stress in microvessels. One typical defect characterizing endothelial damage is microalbuminuria; as developed by Haraldsson, microalbuminuria is not only a local renal phenomenon but reveals a more generalized endothelial dysfunction throughout the body, making this parameter an interesting early marker in clinical settings. Martinez and Andriantsitohaina present a very innovative aspect of microcirculation, namely the recently discovered existence of circulating microparticles. They have different origins and can induce deleterious as well as beneficial effects; although still relatively little is known about microparticles, we felt that this exciting new player was worth being developed in the present analysis. A cardinal feature in capillary perfusion is evidently the flow behaviour of blood, i.e. hemorheology. Hemorheology deals with aspects which have a major, but mostly very local importance, i.e. the physical properties of flowing blood such as viscosity (whole blood, plasma) and erythrocyte deformability/aggregation. While it is easily comprehensible that disturbed red blood cell behavior impairs flow through tiny capillaries, it is less recognized that whole blood or plasma viscosity have major consequences too and, interestingly, they are also very early seen in these IR pathologies as exposed by Brun et al. In the last chapter, divided in three distinct parts, Wiernsperger first critically describe the multiple confounding factors in epidemiological, hemodynamic and metabolic investigations which are likely to severely bias data interpretation; subsequently a broad description is given of the many different diseases characterized by microvascular defects. Of paramount interest are the many studies on healthy first degree relatives of parents with diabetes or cardiovascular diseases, as well as even normal healthy subjects in which the very early appearance of microvascular disturbances strongly suggests that they can be inherited. Part 2 addresses the specific emodynamic effects of insulin itself in the microcirculation and discusses the data under consideration of their physiological pertinence. In particular it is shown that very small increments in plasma insulin such as they occur at the very beginning of meals may be crucial to maximize opening of the microvascular bed in skeletal muscle for supply and storage of excess prandial glucose. Part 3 deals with an analysis of possible mechanisms whereby very early microvascular defects in life might impair proper microflow and thus interfere with the normal handling of glucose by insulin, i.e. induce IR. This book is consciously prospective and proposes a concept based on physiological reasoning and established clinical and pathophysiological observations; by no means does this concept claim to be unique and valid for all situations. We are, however, convinced that there is sufficient available argumentation to deserve further fundamental and clinical research in order to definitively confirm or deny the correctness of what we believe is actually a “solid hypothesis”, namely that microvascular dysfunction can trigger insulin resistance. Michiel P. de Boer M.D. Renate T. de Jongh M.D., Ph.D.
Richard G IJzerman M.D., Ph.D.
L. Guilherme Kraemer-Aguiar M.D., Ph.D.
Eric Raynaud de Mauverger Ph.D.
Eric H. Serné M.D., Ph.D.